Labeler Machines are designed for labelling different types of products such as bottles, cans, cardboard boxes, pet jars, containers of different sizes and many more. These machines have replaced the necessity to depend for man power for every procedure. Automated labelling equipment has made a great difference in packaging industry. Manufacturers on the other hand, try to focus on complicated areas of packaging such as the labelling part and design machine components to make the process highly user-friendly one. The automatic machines are not only effective in performance but they save time, expenditure and above all wastage percentage is very less. How Automated Labelling Device Works? Automated labelling device has absolutely replaced the need for labour power to handle several tasks. With automated machines industries can very well realise that the expenses spent on labour to handle labelling requirements have been reduced to a great extent because except the operating part other labelling techniques are carried out by the machinery. Labelling Equipments are of different types and each type is either designed to meet common industrial requirements or customized as per the client request. Manufacturers also show interest in offering customized label machine designs some of them are bottle sticker labeling machine, top labeling machine, ampoule sticker labeling machine, etc. A bottle labeler machine is a perfect device to stick labels over glass and plastic bottles. 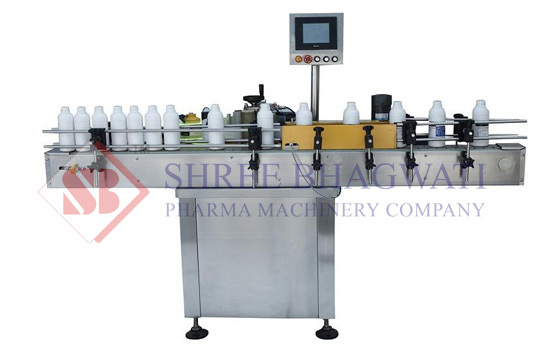 The attractive part of this machine is that it can complete the labelling process over many numbers of bottles in a short time. Similarly, can labelling machine and CD labelling machine are exclusive range of devices specifically designed to handle cans and CDs. Among the automated labeling equipments, the self adhesive vertical sticker labeling machine offered by Bhagawati Labeling Technologies has the capacity to label up to 40 products per minute. The advanced micro processor control provisioned with this equipment keep the machine work efficiently for label dispensing and label sensing. A single side flat sticker labeling machine is a suitable option to label one side of the flat products and it can also be applied for partial labelling requirements. The automatic label length detecting system helps to avoid manual assistance because the label size and dimension can be fed into the machine memory before it is started. 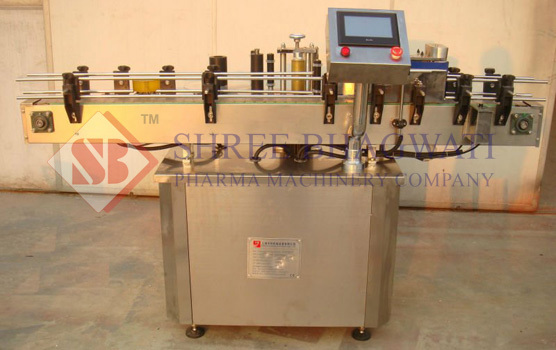 Shree Bhagawati Equipments is a leading machine manufacturer and exporter of labelling machines that suits for ultimate pharmaceutical needs. Machineries offered by them are fully automated, innovative in functionality and shows high performance. In addition, they offer machineries at unbelievable pricing. When it comes to labelling small to medium size containers or products, labelling equipments from Shree Bhagawati Labelling Technologies will stay the right choice. They are not only popular for the quality of machinery but also for the customization options they consider in machine design.